Wolves are an essential part of the balance of nature. They keep elk and deer herds healthy by ensuring the healthiest animals survive. This, in turn, keeps vegetation communities healthy by balancing the levels of herbivores. Many studies have shown the important role predators play in maintaining ecological health. Unfortunately, wolves’ ability to fill their wild niche has been compromised by conflicts with public lands ranchers and agency aversion to doing what it takes for wolves to survive. The Mexican gray wolf (Canis lupus baileyi) was once completely extirpated from its historic range in the U.S. at the behest of the livestock industry. The wholesale slaughter of predators to protect private cattle eliminated the Mexican gray wolf from the southwest. Fortunately, five wolves were found in Mexico and the species was brought back from the brink of extinction through captive breeding. In 1998, the U.S. Fish and Wildlife Service began releasing wolves into the wildlands of Arizona and New Mexico. Thirty-two years after receiving protection under the Endangered Species Act, and twelve years after the Fish and Wildlife Service began its reintroduction program, scientists still consider the Mexican gray wolf the most endangered mammal in North America. There are approximately four dozen wolves in the wild, far short of the goal of 100 wolves and 18 breeding pairs that was originally established for the reintroduction program. Many of the setbacks to wolf recovery can be attributed to federal mismanagement. Despite these shortcomings, the program is a success. Once on the very edge of disappearance, four dozen wolves roam the Blue Range Wolf Recovery Area (BRWRA), raise pups, howl into the wilderness, and succeed at being wild. Recent programmatic changes give the wolves a better shot at long-term recovery. Western Watersheds Project was part of an effort to end the controversial “three-strikes” rule which had resulted in the removal of wolves known to have depredated three cattle in any calendar year. By removing this proviso, wolves like the Middle Fork Pack- an unlikely success story of two three-legged alphas- get to stay wild and rear their young without penalty. This is important biologically because wolves are intelligent, family-oriented animals. Shooting and trapping them disrupts their packs, separates mated pairs and can leave pups without parents. This can lead to greater incidence of depredation among the remaining wolves. Still, more needs to be done. For one, Mexican gray wolves need to be granted the full legal protection of the Endangered Species Act. At present, the wolf is listed as “experimental, non-essential,” which means that there are fewer prohibitions on “take” than for fully protected species. This allows wolves to be lethally removed or permanently confined. The Mexican gray wolf is endangered, and its time for the agency to give this species the full legal protection and recognition it deserves. Another change involves allowing wolves to roam. At present, when wolves leave the BRWRA, they are immediately subject to administrative “removal.” In 2007, two wolves were removed for this reason. The BRWRA is plenty big- 4.4 million acres- but wolves don’t see the politically-imposed limits on their territories. Wolves should be free to roam wherever they see fit. This is the essence of recovery. The FWS needs to remove the arbitrary boundaries being imposed on this wild animal. Additionally, the U.S. Fish and Wildlife Service needs to focus on enforcement of anti-poaching laws. Too many of the wild wolves have come up suspiciously missing. Killing a Mexican gray wolf is a violation of the federal Endangered Species Act and is punishable by up to a year in jail, criminal fines of up to $50,000 and civil penalties of up to $25,000. The FWS offers monetary rewards for tips leading to the conviction of people who have harmed wolves, and the government needs to start investigating and prosecuting these crimes. Western Watersheds Project has offered money in a fund totaling $50,000 for any information leading to the arrest and conviction of a wolf poacher. These are just a few of the changes Western Watersheds Project is working towards in order to improve Mexican gray wolf survival in the wild. For more information, contact arizona(at)wwp.cleanwebdesign.com. 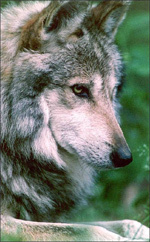 Check out www.mexicanwolves.org for more on the species biology, pack histories, and updated media coverage of the Mexican gray wolf.